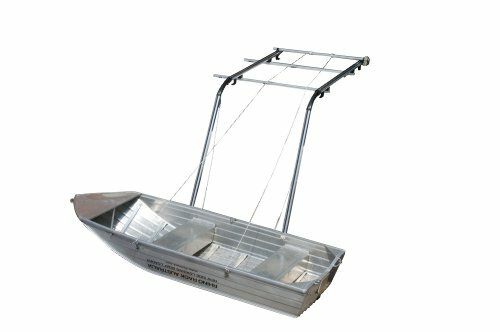 The Rhino Rack Side Boat Loader is a revolutionary product designed to take the hard back breaking work out of lifting your small boat on and off your vehicle's roof. With simple one man operation, you can easily winch your aluminum boat up & down from your vehicle with a battery powered cordless drill (Rhino recommends 18 volt drill). The side boat loader can be used on a range of vehicles including 4WD's, low roof camper vans and station wagons. The basic principle is in dragging the boat up two ramps set at approx a 50 degree angle to the ground and over the top of the vehicle by means of a 40/1 worm drive gear which turns the winding roller. Ropes are attached to the far side of the boat and also 2 shorter gunnel ropes are attached to the near side. When lifting commences, the boat is “flipped” over and then slides up in the inverted position. The key requirement in loading and unloading is that the vehicle must be on level ground as the ramp structure and main support cross bars are extremely slippery. A second person can always be used in adverse conditions to stabilise and stop any forward or rear excessive slippage.